It’s about that time of year when you can step outside and clip flowers from your garden. No more grocery store flowers! This is Jennifer Zuri from Town and Country Living and one of my fetishes is fresh flowers. I don’t care if they’re cut flowers or a flowering plant, but I crave their beauty in my home. 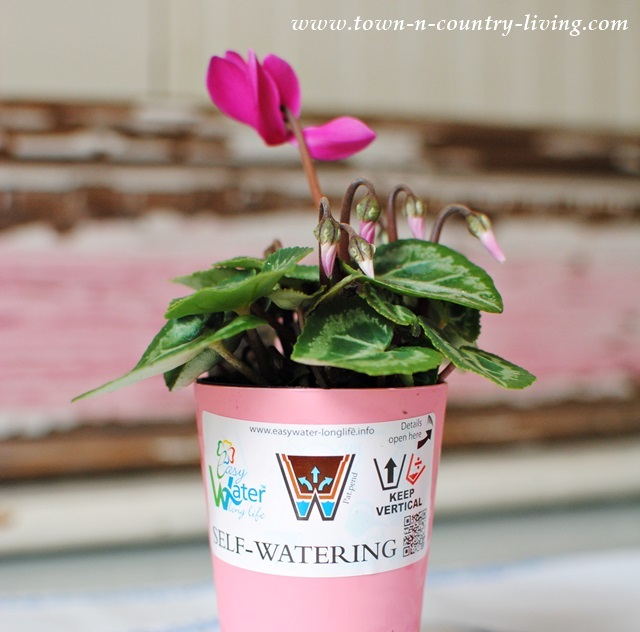 One thing I don’t crave is the plastic pots that cradle simple flowers like cyclamens so I’m always concocting ways to hide the plastic, or in this case, get rid of it all together. 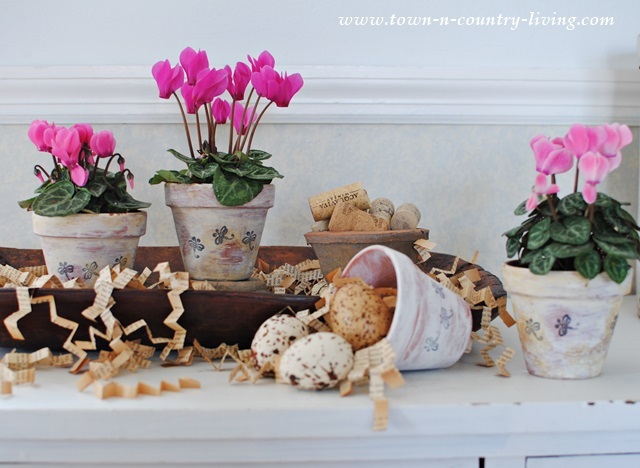 Today I’m sharing how to transform an ordinary grocery store cyclamen with a flower pot makeover with chalk paint and hand stamping. This is what we’re going to end up with when it’s all said and done. … until I turned them around and saw they have a self-watering function. So even though I’m not using these for my pretty pink cyclamens, I’m going to hang onto them to start herbs from seed. 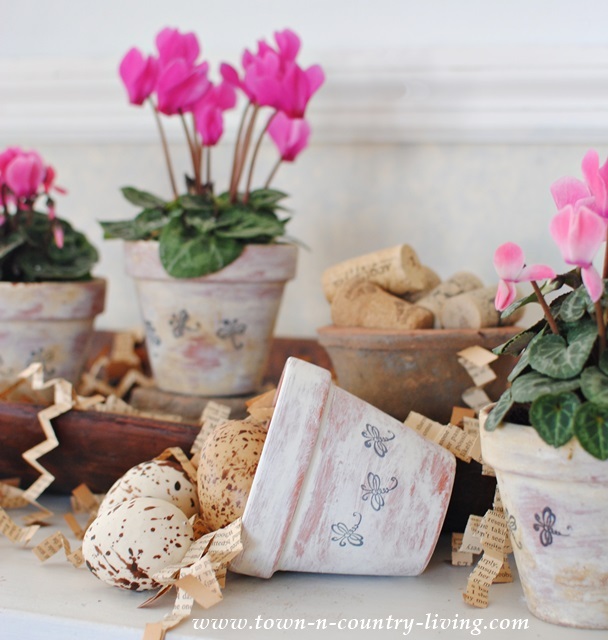 Miniature cyclamens are dainty and feminine, so I wanted to off-set that with something a little more rustic. 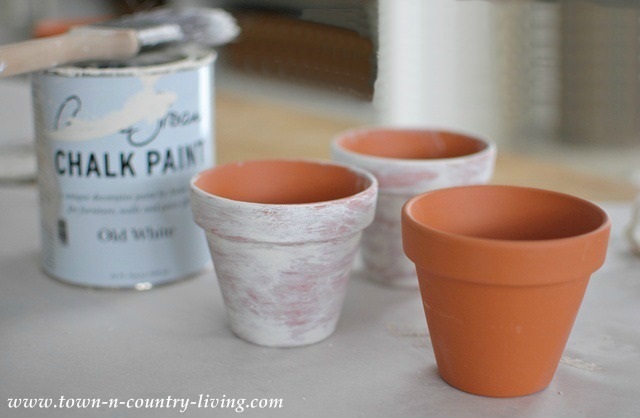 I purchased 99-cent clay pots and gave them a light coat of Annie Sloan Chalk Paint in Old White. Before the paint dried, I dabbed each pot with a slightly damp paper towel, removing some of the paint. 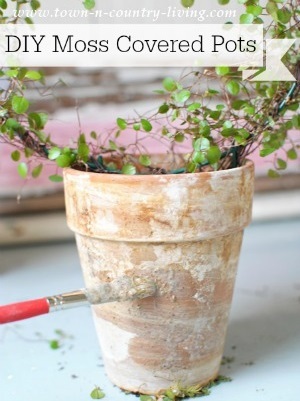 Work with one pot at a time since the paint dries quickly. I then repeated this procedure on the inside of the clay pots. Thinking the white might be a little too stark and plain for the miniature pink cyclamens, I decided to apply a dragonfly stamp with black ink. 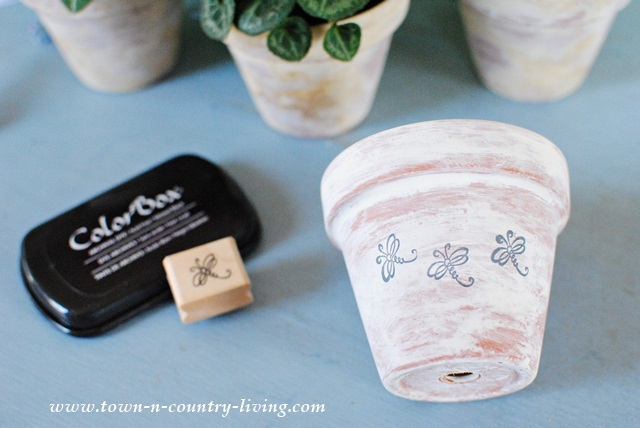 If you don’t want to stamp the pots, you could also just tie a pretty ribbon or piece of jute around them. Before transferring the mini cyclamens to the whitewashed clay pots, I added a few stones to the bottom to provide additional drainage for the plant. This is a trick my mother taught me. 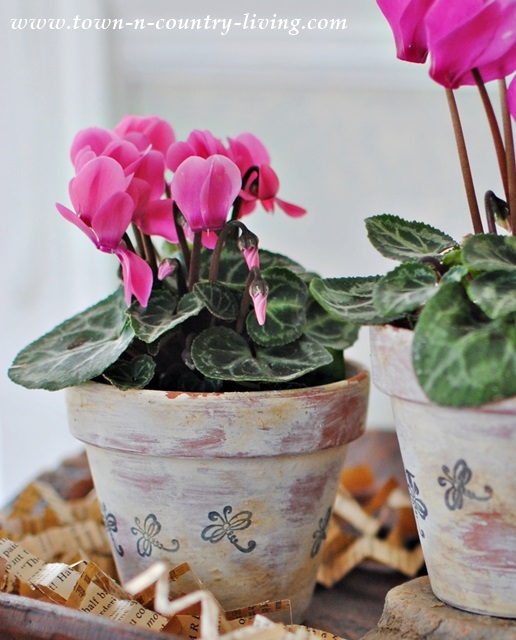 Then it was just a matter of carefully transferring the cyclamen to the clay pot, adding soil as needed. I lightly tapped down on the soil around the edge of the plant to remove any air bubbles, and watered them. And this is when the magic happens! 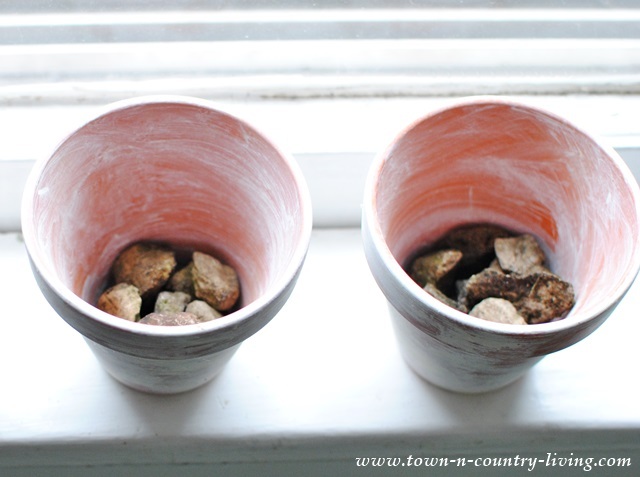 The clay pots will absorb some of the moisture out of the soil when the plant is watered, and the paint begins to take on a rusty hue making the pot look aged. I’m sure there’s a scientific explanation on how this happens, but I’m just happy that this transformation takes place without much effort on my part! You can see in this photo that the clay pot without a plant is still white and clean, while the pots with the cyclamens are getting that crusty look to them. 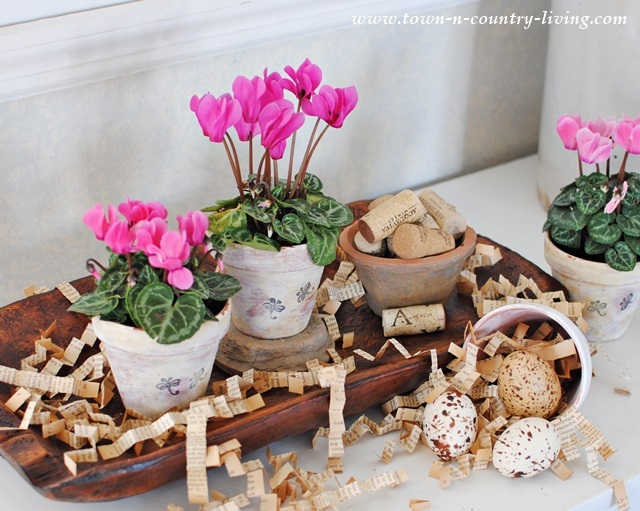 So for minimal cost and effort, you can transform an ordinary grocery store cyclamen into something completely pretty and unique! 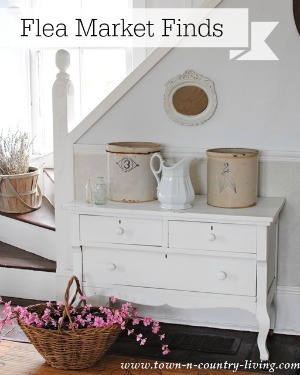 I hope you’ll visit my blog over at Town and Country Living. I used to do something similar to pots as you’ve done. I’d almost forgotten. 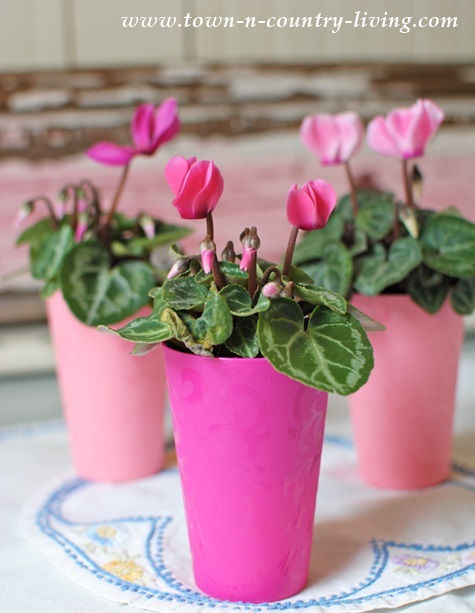 I love the look the painted flower pots gave the beautiful Cyclamens. 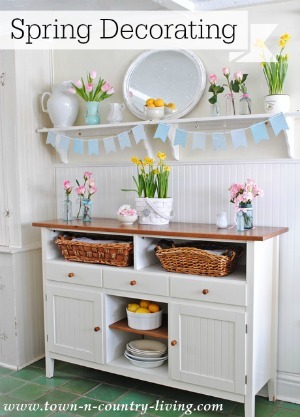 It’s a touch of Spring for any room! oh! These plant pots are wonderful! I must try this technique on my own. Im so glad I found your blog today!